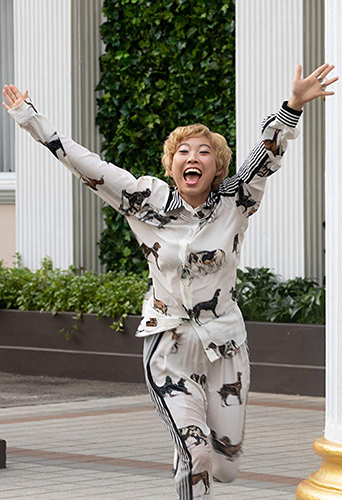 Joyce Glasser reviews Crazy Rich Asians (September 14, 2018), Cert. 12A, 121 min. From The Great Gatsby and Citizen Kane to Clueless, The Aviator, Something’s Gotta Give and The Wolf of Wall Street American films have exported their and glamorous sets, settings, lifestyles and characters to less materially endowed countries. For the price of a ticket anyone could escape their mundane lives and dream about how the other half live. 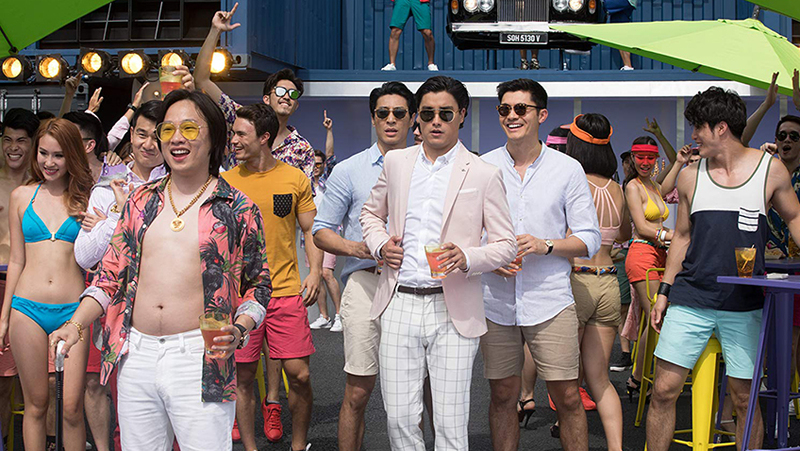 But if there is one reason to see Jon M. Chu’s Crazy Rich Asians , based on Kevin Kwan’s quasi autobiographical novel , it is because all that is changing. Now for the first time since The Joy Luck Club in 1993, but with much broader strokes, we have a film with an all Asian cast and none of them are servants or dish washers. In fact, they are filthy rich, judgmental, elitist and, when it comes to money, vulgar and proud. But if you take away the Asian faces (and star Henry Golding is only half Asian while Gemma Chan plays an American-born Chinese teacher) you have a ‘Meet the Parents’ type American romcom and wedding movie complete with all the tropes of these genres. American cinema leads the world and has cornered the market on romcoms and wedding movies, but there is no denying that Crazy Rich Asians has hit a nerve. It is not only Asian audiences flocking to see themselves, or a version of themselves, represented on the big screen internationally. Americans of all backgrounds are flocking to see deluded American dream shift hemispheres. In a kind of prologue, an impossibly snooty manager at a luxury hotel insults an Asian woman and her two spoilt brats when she arrives with a reservation. ‘May I suggest Chinatown,’ he says, showing her to the door. The punch line is that this lady returns and is presented to the grovelling manager as the hotel’s new owner. NYU Economics professor Rachel Chu (Constance Wu) is not just a pretty face or a token woman in a man’s job; she is a specialist in Game Theory, a kind of psycho-strategic economics, and tells her class, ‘the key is playing to win, instead of trying not to lose.’ In the cutthroat game she is about to play with the super-rich Singaporean Young family clan, it will be challenging to apply that adage. Rachel is Chinese, but born in America to a hard-working, loving single mother in circumstances that her mother, Kerry (Kheng Hua Tan) has kept secret from her. Rachel earns a good living, but she is middle-class. Rachel has been dating affable Nick Young (Henry Golding, A Simple Favour) who has been in the USA preparing to take over the family business in Singapore and marry into a similar family – although he has now changed his mind. Rachel knows nothing of this, or of his wealth or background, and he likes it that way. 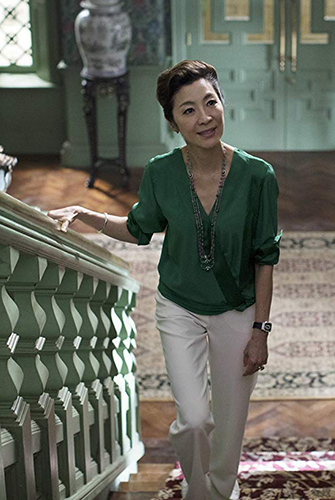 Now that he is reassured that she is not a gold digger (men like Nick have this problem), he wants to take her home to meet her fierce, domineering, adoring mother Eleanor Sung-Young (Michelle Yeoh). Eleanor is the most challenging, but not the only obstacle Rachel faces. As the fiancée of the most eligible bachelor in Asia, Rachel is subjected to the wrath of jealous single native daughters. Rachel’s first inkling (really – after a year?) of her soon-to-be-fiancée’s double life comes when she protests at the error when they are shown to their first class bed/seats on the plane. ‘My family have connections with the airline,’ Nick mutters. And the Cinderella story that we all know and love continues in that vein until the wicked step-mother becomes the wicked future mother-in-law. This is where all the extremes of excess that everyone is raving about start and where the film ends. Crazy Rich Asians follows the predictable arc of the American romcom, except for its tiresome focus on wealth, class and tribalism (putting the family first is a woman’s duty). For urbanites who have long ago stopped distinguishing people by colour or race on the street, it is something like the old television show Dallas updated and transferred to Singapore. Textiles and not oil is the basis of the wealth, but little matter as there are no environmentalists anywhere. And, like Dallas, there is infidelity. 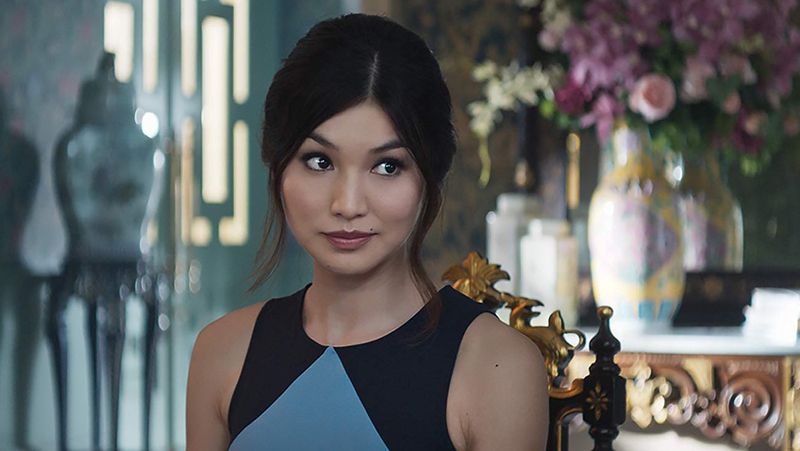 Nick’s gorgeous, perfectly groomed cousin Astrid (Gemma Chan) discovers her hunky husband is cheating on her. Astrid’s practice of hiding her regular purchases of expensive jewellery may be well intentioned: to spare him a reminder of his inferior financial status, but it is affecting his masculinity. The moral of the story is that money can’t buy happiness, but it certainly buys everything else anyone wants and no one is giving it away to charity. If only the film had more of this humour, and scenes like the opening in the hotel to make us reflect on the shift in the balance of power. Perhaps prejudice against – to quote from South Pacific – ‘people whose skin is a different shade’ will only cease when white westerners are turned away at the reception of posh hotels. Otherwise, after an amusing first half, the story becomes formulaic and repetitive as we meet more and more hedonistic, vapid people with an obsession for shopping. No one is caught reading on the plane or at the beach. The only book in the film is in Eleanor’s bible reading class. While Buddhists, Muslims and Taoists represent the majority of the population it is convenient in terms of the American and European box office that the Young family belong to the elite Christian minority.